ICGâ€™s first sailing was on May 17, 1968 from Roslare to Le Harve. It was a joint operation by Normandy Ferries (NF) (owned by P&O) and the shipping line Saga (owned by the Rothschild family). In its first season the service carried 31,000 passengers and in 1969 the service was increased to a twice-weekly sailing. The ships used were the Dragon and Leopard, owned by NF. At the end of 1971, the service came to an abrupt end, when NF realised that, to maintain their completive edge on the English Channel the Dragon and Leopard could not continue to operate the service. Given the short notice, it was impossible to charter suitable replacement ships for the route with the result that 1972 came and went with no Ireland-France service. But behind the scenes, frantic efforts were being made to re-establish the service on a sounder footing, one that would have its commercial roots in Ireland. In 1972, the then Government requested B&I Line and Irish Shipping to consider the possibility of re-opening the service. Irish Shipping took up the challenge. Irish shipping was set up in 1941 by Eamonn De Valera to supply Ireland with imported essential supplies during World War 2, or the Emergency (as it was called in Ireland). After the Emergency, the company returned its charted ships and began to acquire its own newly built fleet. In 1972, Irish Shipping set up a new company, Irish Continental Line, in partnership with other Irish and Scandinavian interests. 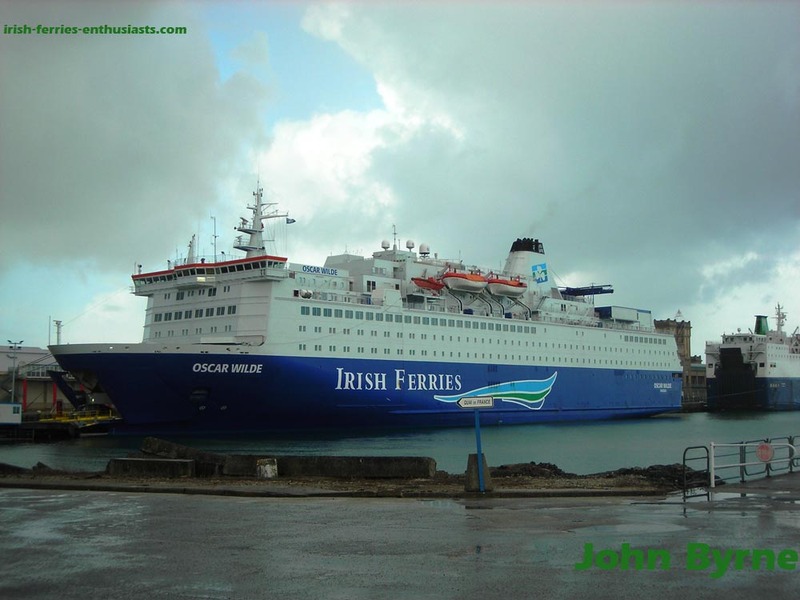 A new car ferry, with 547 berths and space for 210 cars was purchased for the Ireland rance route. The ship was launched on January 17th 1972, named St Patrick, at Schichau Unterweser, Bermerhaven, Germany. With a financially stable ferry operation and a comfortable modern ship, the concept of motoring holidays to France became popular among Irish holidaymakers. This was matched by an equal interest in Ireland among Continentals, particularly French, Germans and Dutch. Haulers also took advantage of the direct sailings to France and the service grew. In 1976 a subsidiary company, Ferrytours, was established to promote holidays to France. In â€™77 the ownership of the St Patrick was transferred form Irish Shipping to ICG, a move that was to prove its self in the mid â€˜80s when Irish Shipping went into liquidation. After the transfer of the St Patrick to ICL, a decision was made to purchase a second ship, the St. Killian. 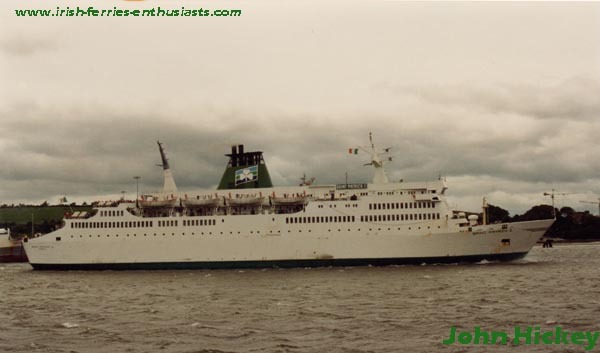 Built in 1973 for Stena line, she was purchased and put into service between Ireland and France in â€™78. After the difficulties of the â€˜70s, the company started to plan a head. A new Belfast-Liverpool service was launched on May 1st, 1982. The St Patrick was renamed the St. Colum 1 and a new company, Belfast Car Ferries was formed. The new service looked promising, however faceing competition from other routes the service was close down in October 1990 with the ship being sold to Greek owners. Meanwhile, back in the south, there was another event. In an Amsterdam shipyard work began on the jumboisation of the St Killian by cutting it in two and adding a new 32 metre mid section costing Â£7.5m. The works, which took just 3 months to complete, increased the number of berths from 800 to 1,400 and garage spaces from 20 to 300. The ship was renamed St Killian II and returned to service. To replace the St. Patrick on the Ireland-France service a new vessel, the Aurella (SF Line, Finland), was purchased at a cost of Â£16.5m. She was refitted in Amsterdam and renamed the St. Patrick II. Saint Patrick II leaving Cork. In 1983, a third summer service was started between Cork and Le Harve, with sailings from the end of June to the end of August. The route proved popular with Irish as well as Continental holidaymakers who wished to arrive closer to Cork and Kerry. With year on year improvements in traffic and revenues, dark storms were brewing. In 1979 and 1980 a series of charter deals for Irish Shipping vessels was arranged in Hong Kong, commitments that were considered financially ruinous for the company. Irish Shipping was trading against a dismal world economic background, which made freight carrying an unprofitable proposition. When the then Government decided to put Irish Shipping into liquidation towards the end of 1984, there was a public outcry with calls that Ireland was being deprived of a strategically important deep sea fleet, one that had proved its worth for over 40 years, in conditions of war and peace. Despite these calls, the Government proceeded with the liquidation of Irish Shipping, which became effective in November 1984. For two and a half years, Irish Continental Line carried on in a state of uncertainty, an interregnum between ownership. In Christmas, 1985 advertisements appeared in the national press inviting purchase offers. In January 1986 the bidding was led by B&I Line, which put a valuation of Â£7m on Irish Continental Line. In all, there were 24 potential bidders, including a consortium of freight companies. During the course of 1986 two bids materialized from groups within the management of Irish Continental Line itself. In November 1986 sole ownership of the two Irish Continental Line vessels was acquired, a move which cleared the way for the completion of the sale which took place in March 1987 when a consortium of institutional investors was successful in its bid for the company. Under new ownership, a big revamp began; Irish Ferries and Belfast Ferries were the new operating divisions. The Board of Directors was restructured, a new Managing Director was recruited, and steps were taken to revitalise the company. APEX fares and other incentives were introduced to give customers the benefit of discounts for early bookings. Freight customers were given a more competitive tariff structure. New quality standards were introduced throughout the company and the ships were refurbished. Much organisational change took place and there was also a change of image. A new corporate identity and logo were introduced with new colour scheme and a shamrock logo. In 1988 the company made its stock market dÃ©but. During 1990, a total of Â£1 million was spent refurbishing and improving the two ships and in 1991, a â€˜Quality Countsâ€™ program was launched. In 1991, ICG reached conditional agreement to purchase the share capital of the B&I Line, and in early 1992 it was formally announced that Irish Continental Group had acquired outright ownership of B&I Line after nearly two years of talks on the purchase with the Government. The acquisition immediately enhanced the status of ICG and positioned the company as Irelandâ€™s leading Irish passenger car ferry and freight shipping enterprise with a range of services to France, the UK, Belgium and Holland. 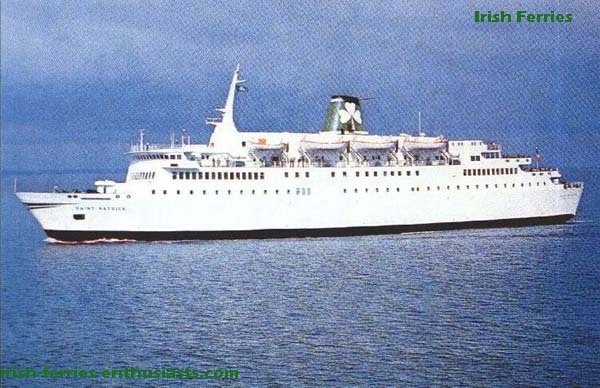 In 1992 the super ferry, Isle of Innishfree, was purchased to replace B+Iâ€™s Munster on the Rosslare â€“ Pembroke route and a winter charter was secured for IFâ€™s St. Patrick sailing between Finland and Estonia. In 1993, ICG purchased the vessel Pride of Bilbao, the 5th largest car ferry in the world at the time. The ship was, and still is under charter to P&O. On January 27th 1995, the new Â£46m Isle of Innisfree was launch at the Rotterdam yard of Van der Giessen-de Noord. The ship entered service between Dublin and Holyhead on May 23rd. Also, in 1995, the B+I Line name was dropped from all the B+I ships. It was replaced with the Irish Ferries title and logos. 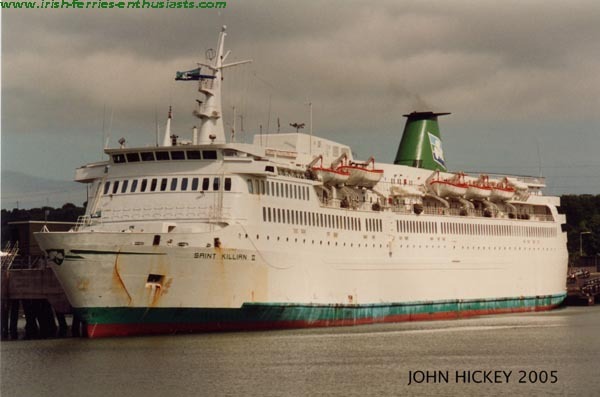 In 1997 the Saint Killian II was withdrawn from service after fourteen years of service, following her final departure from Ringaskiddy, to Le Havre on September 27th 1997. During 1998, the vessel was sold to Cap Enterprises (Marintas) of Piraeus and re-named â€˜Medina Starâ€™ before entering service on the Black Sea. In April 1998, the chartered Swedish-owned MV Normandy began serving on the Rosslare- France routes. Cork and Le Harve were dropped from the service. The St. Patrick also left the fleet in â€™98, when a four and a half year charter was agreed with Hellenic Mediterranean Lines of Greece. Under the agreement the title was transferred on completion of the charter. New uniforms were also issued and an order for the Dublin Swift was placed with Austal Ships of Australia for the construction of a new high-speed ferry for operation between Dublin and Holyhead. On July 8th, 1999 an order for a 50,000 tonne gross vessel was placed with Aker Finnyards OY in Finland at a cost of E100m, the MV Ulysses. In august the Normandy undertool an Eclipse of the Sun cruise and was purchased from Stena Lines for E17.7m. In January 2000, the keel of the new Ulysses was laid and the name chosen. IF win Irelandsâ€™ â€œBest Ferry Awardâ€ for the 3rd year and in April, the â€œFerry Freight Operator of the Yearâ€. On Sunday, March 4th the M.V. Ulysses arrives in Dublin for the first time following her 4-day voyage from Finland. Mairead Berry – Irelandâ€™s 25-year old Paralympic Games gold medalist is the Ulyssesâ€™ godmother to at a special ceremony held in Dublin attended by An Taoiseach, Bertie Ahern TD (Wednesday, March 21st) in advance of her maiden voyage to Holyhead (Sunday, March 25th). In May Ulysses won the prestigious ‘Most Significant New Build – Ferry’ category award in the Cruise & Ferry magazine 2001 Awards competition. On the 23 February 2004, Irish Ferries announced that the firm could have closed over a dispute about a cost-cutting plan is not resolved soon. Director of human Resources announced the lay off 600 staff in the following few days. Also announced was the suspension of the swift ferry from Dublin to Holyhead, the Rosslare-Pembroke service, and the Rosslare route to Cherbourg and Roscoff. On the 24 March 2005 it became known that, according to SIPTU that Irish Ferries’ outsourcing company was paying a Filipina woman just over â‚¬1 an hour to work as a beauty therapist on board the Isle of Inishmore. Salvacion Orge had just begun working as a beauty therapist on the ferry, but the company ended her contract by closing down the service following queries about the wages she was being paid. She refused to disembark from the vessel. A meeting took place on the 29 March 2005 and after two hours of negotiation between her management and the trade union SIPTU, Ms. Orge was granted â‚¬24,000 and the crew on board the ferry also made a collection for her totalling around â‚¬1,000. The next day she flew from Dublin to the Philippines and was reunited with her three teenage children. On the 19 September Irish Ferries offered voluntary redundancy packages to its 543 seafaring workers on its Irish Sea services on the Dublin-Holyhead and Rosslare-Pembroke routes. The firm states they couldn’t continue to operate with high fuel costs and increasing competition from rival shipping operators and low cost airlines. The statement went on to say the situation had deteriorated this year with a 9% drop in the Irish Sea car passenger market and rises of up to 50% in the cost of fuel. These voluntary redundancy packages were offered as a direct result of unsuccessfully negotiating with SIPTU and the Seaman’s Union of Ireland to achieve cost reductions. The decision by Irish Ferries to outsource crewing on its Rosslare to France routes earlier this year led to a strike and demonstrations in France. On November 24th 2005, agency security staff boarded the Isle of Inishmore, and 4 engineers took control of the engine control room, where they remained for 22 days in a standoff between the management and the crew and an intense political debate. On the 9th December 2005 a nation wide day of protest was called by the Irish Council of Trade Unions against the companies actions. Over 100,000 people participated, including 40,000 in Dublin. The protest stopped all public transport for over four hours. 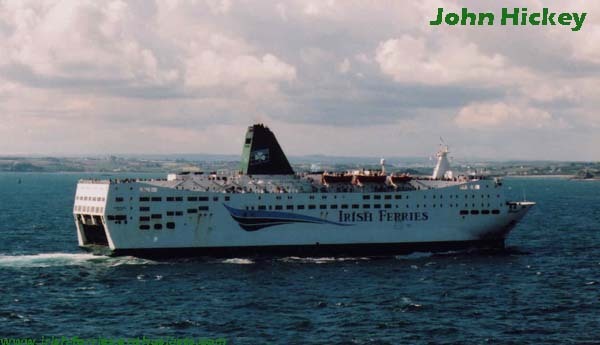 During the January 2006 refits, the Ulysses Jonathan Swift, and Isle of Innismore were re-registered in Lisammol, Cyprus (Isle of Innismore being the last to fly the Irish flag) and the company kept 48 Irish crew on. 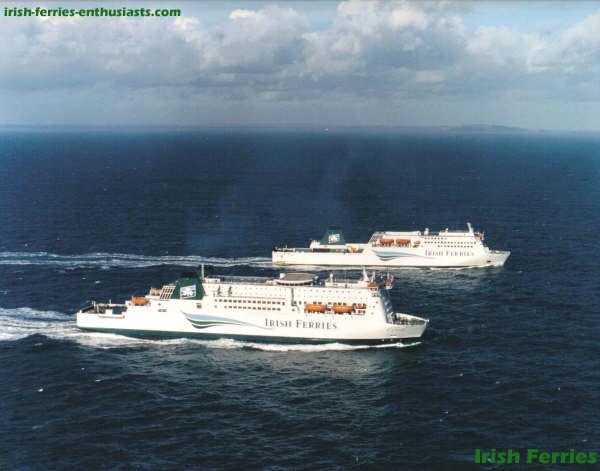 On January 18th 2007 Irish Ferries announced that following P&O’s decision to extend charters on two vessels, that it was to replace the Normandy with the “Kronprins Harald” which was sailing for Colour Line. The new ship was renamed Oscar Wilde, and underwent extensive rebuilding in Fredericia, Denmark. The Normandy arrived for the final time in Rosslare on November 4th, and sailed for layup in Fredericia the next day. The Oscar Wilde left Rosslare for the first time under the command of Captain Gordon 17.10 on November 30th, and headed into a rough Celtic Sea. On January 29th, the Oscar Wilde called to Dublin for her official renaming ceremony. On February 10th the Normandy’s sale to Equinox Offshore Accommodation, a Singapore based company controlled by Norwegian interests, for â‚¬15 million was confirmed. She is to be converted into a an offshore accommodation and repair vessel (ARV), and her conversion work will be carried out in Sembawang Shipyard, Singapore. In November 2013, Irish Ferries announced plans to expand Dublin – Holyhead, and Ireland France services, by chartering the Cartour Epsilon. She arrived in December, taking up sailing between Dublin and Holyhead in the run up to Christmas, and starting a new Dublin – Cherbourg route on January 18th, 2014. In April 2016, ICG announced the purchase of high speed craft Westpac Express form a US based coporation. The vessel was on charter to the US Marine Corps in Japan, where she remained. In May 2016, Irish Ferries announced they had signed contracts with German yard Flensburger Schiffbau-Gesselschaft & Co.KG to build a new cruse ferry, with space for 1,885 passengers and crew, with 435 cabins and with capacity for 2,800 lane metres of freight, with delivery expected in May 2018. The new vessel is expected to replace the Epsilon.